Mark Nepo has been immersed in a path of spiritual inquiry for more than forty years. 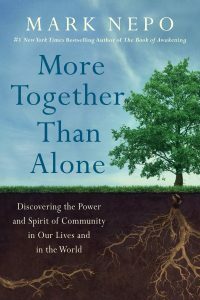 He is the author of twenty books, including the #1 New York Times bestseller The Book of Awakening and his newest book, More Together Than Alone. His books have been translated into more than twenty languages. In 2014, Mark traveled the country with Oprah Winfrey on her sold-out The Life You Want Tour and has appeared several times on her Super Soul Sunday program. In this conversation, we catch up with Mark (he’s been a guest twice before) and dive into his decades-long inquiry around how we are wired to live in community, what happens when the bonds that connect us fail and how to rediscover community at a time when we seem more divided than ever. Want more of Mark Nepo? You can listen here to our 2015 conversation and our 2016 conversation. ShipStation: Manage and ship your orders. FREE for 30 days, plus a bonus. Visit ShipStation.com, click on the microphone at the top of the homepage and type in GOODLIFE. Everlane: Check out our personalized collection at Everlane.com/GOODLIFE plus, you’ll get free shipping on your first order.